Beautifully engraved certificate from the 1-800-Attorney, Inc. This historic document was printed by the Northern Banknote Company and has an ornate border around it with a vignette of the company logo. This item has the printed signatures of the Company’s President and Secretary. Order of Suspension of Trading; In the Matter of 1-800-ATTORNEY, Inc., et al. It appears to the Securities and Exchange Commission that there is a lack of current and accurate information concerning the securities of 1-800-ATTORNEY, Inc. because questions have arisen as to its operating status, if any. 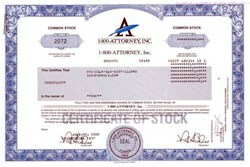 1-800-ATTORNEY, Inc. is quoted on OTC Link operated by OTC Markets Group, Inc. under the ticker symbol “ATTY". 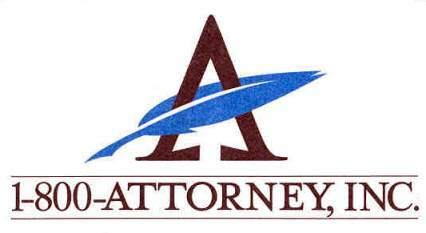 1-800-ATTORNEY, Inc. also know as 1-800-Attorney.com (formerly The Publishing Company of North America, Inc.) is the parent company of its wholly-owned subsidiary, PCNA Communications Corporation . Law firms pay monthly fees to 1-800-Attorney to have callers referred to them for business. It has 80 employees, including workers at PCNA Communications Corp. 1-800-ATTORNEY, Inc. was incorporated in September 1993 in the state of Florida.